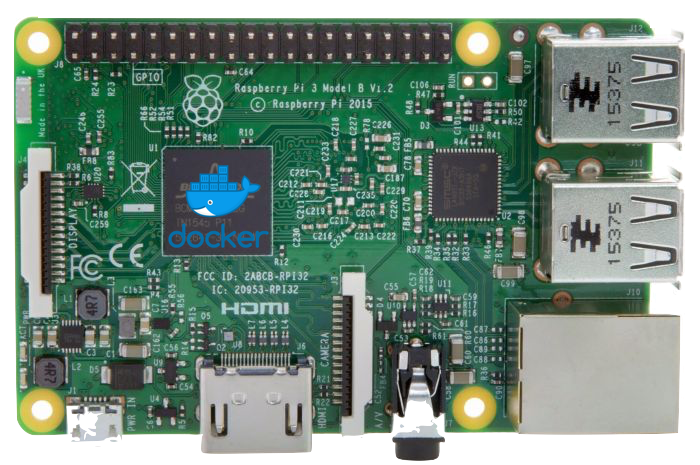 Install Docker on Raspberry Pi - Steven B. To run docker on your raspberry pi, we need to install the main filesystem on our microSD card which the pi can boot from. Since we will only use the terminal, there’s no need for installing a desktop environment so download the Raspbian Jessie Light image on their website. When the writing is done, plug in a USB keyboard and screen into your raspberry pi, insert the sd card and power on your pi. If using a network cable connect it now. Wifi will be set-up later. I recommend using a wired ethernet connection to your raspberry pi, this minimizes the risk of random disconnects due to losing wifi connectivity. I also highly recommend using a static IP for your raspberry, this can be done in your router by assigning a static IP to your raspberry pi’s mac address. Then, to remotely access the pi, I will enable ssh so the USB keyboard and screen are not needed anymore. Simply connect an ethernet cable to your raspberry pi’s ethernet port, no other steps necessary as long as your router’s DHCP provides an IP. When starting the pi with the network cable attached, the console should print it’s IP when it was able to obtain one. Enter your passphraze and your raspberry pi should connect to your wifi. Setting a static IP in your router is different for each brand and/or model, I’ve got a Netgear R8000. The static IP settings are located under: General Settings -> Lan Settings -> Static Route. You usually have to provide a name, IP and mac address to add the static route to your DHCP. This entry will make sure your raspberry pi always gets the same pre-assigned IP from your router. Once ssh is enabled and your network is connected. You can remotely set up your raspberry pi using Terminal(mac) or putty(windows). To connect simply run “ssh pi@(RASPBERRYPI’S IP)” then fill in the password (raspbian by default). you can also continue using the USB keyboard, the steps remain the same. If both packages print their version correctly, your docker setup is completed. This entry was posted in Raspberry Pi and tagged balenaetcher, docker, docker-compose, docker-compose.yml, easy, fast, guide, image, ip, quick, raspberry pi, raspberrypi, raspbian, Simple, super easy, tutorial, win32imager. Bookmark the permalink.